Students registered in 1.5 or more credits are charged the Universal Bus Pass (U-Pass) Fee. With your U-Pass, you have access to St. Catharines, Thorold, Niagara Falls, Welland, Fort Erie, Pelham and the Niagara Regional Transit Systems. The U-Pass works between September 4th and April 30th. During O-Week, students can pick up their pass at Vendor Fair (Weather Station Field) to get their 2018-19 U-Pass sticker. For more information on your Universal Bus Pass, how to get to Brock and around the Niagara Region, please check out the resources that we have provided on this site. If you have any questions, please feel free to contact your Vice President Finance & Administration (contact information to the left). Each year Brock students use St. Catharines & Thorold Transit over 2,500,000 times. Knowing this, BUSU has arranged for over 15 dedicated routes that will get students directly to Brock. We encourage you to download the St. Catharines Transit app (link found on right) so you can be sure to never miss a bus and always know which routes will get you to your destination. Please familiarize yourself with the maps, routes and timing as you may live in an area that requires you to transfer buses at the Pen Centre or Downtown Terminal. Remember, you a required to have a valid 2017-18 U-Pass sticker on your Brock ID to ride the bus. Niagara Falls, Welland, Port Colborne, Niagara-On-The-Lake(NOTL) and Fort Erie. Students can utilize the NRT Routes to get around the region and to get to major transit hubs like Brock University, Niagara College, Downtown Terminals and the Pen Centre. Students looking to access the Niagara Collection Outlet Mall in NOTL can take NRT Route 40/45 from the STC Downtown Terminal or directly from the Niagara Falls Terminal. Students travelling from Niagara Falls to Brock will use the NRT Route 50/55. Students wishing to use GO Bus Service can use 50/55 or 70/75 to access STC Downtown Terminal then transfer to the 40/45 to Fairview Mall or continue on this route to Niagara College NOTL Campus. Check GO Bus schedules for your best route options. Students can use the 50/55 and 70/75 to access STC Downtown Terminal and the Pen Centre. Students looking for late night and weekend service in Downtown Thorold can use the 50/55 which stops at Towpath before departing to Brock. Welland Transit offers two (2) types of transit options for students; Brock Direct and Inner-City service. 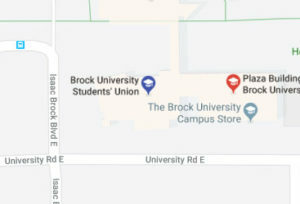 The direct to Brock Route is called the “Brock Link” and it departs from Niagara College at 7:30am and arrives at Brock at 7:50am. The service runs hourly which means it departs from Niagara College on the :30’s (7:30, 8:30, 9:30….) and arrives at Brock on the :50’s (7:50, 8:50, 9:50….). The last bus to Brock on the “Brock Link” leaves Niagara College at 9:15pm and arrives to Brock at 9:35pm. The last trip from Brock to Niagara College on the “Brock Link” leaves at 10:00pm and arrives at Niagara College at 10:20pm. The “Brock Link” only runs Monday to Friday. Students are required to use the various Welland Transit “inner-city” routes to get to Niagara College to catch the “Brock Link” and to get home after arriving back in Welland on the “Brock Link”. The full “inner-city routes, timing and maps can be found on the right side of this page. Students will be required to swipe their Brock ID on Welland Transit Routes this year so they can collect ridership data. Students will need to have a functioning Brock ID with the correct U-Pass 2017-18 sticker on it to ride. Students looking to travel from Welland to Brock on Saturdays will need to use NRT Route 70/75 which runs hourly starting at 7:10am from the Welland Terminal, 7:18am from Seaway Mall and 7:24am from Merrit Rd/Niagara St. This route arrives at Brock (Glenrdige/East Academic) at 7:34am. The last stop at Brock University is at 8:29pm. There are no updates or information at this time for Niagara Falls Transit.